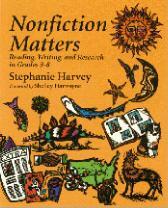 Stephanie Harvey, Stenhouse Publishers, 1998 – Stenhouse Publishers writes: "When we open the gates to nonfiction inquiry, we open our thinking and expect the unexpected, making reading discoveries, research discoveries, and writing discoveries on our way. Nonfiction Matters offers teachers the tools to help students explore nonfiction and dig deep to reach more complete understanding of the real world and report these insights in a compelling manner." Stenhouse lets you preview the book online and provides a downloadable study guide if you buy. Stephanie Harvey and Anne Goudvis, Stenhouse Publishers, 2006 – This is a DVD with study guide. Stenhouse Publishers writes: "Join Stephanie Harvey and Anne Goudvis authors of Strategies That Work in a reading workshop as students begin to explore the wild and wooly world of non-fiction where merely getting the facts isn't enough. 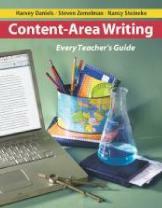 Nonfiction readers need to merge their thinking with the information – to learn, understand, and remember it." Stenhouse lets you view a clip from the 30-minute video. Also available in VCR format. Stephanie Harvey and Anne Goudvis, Heinemman, 2005 – Heinemann writes: "The Comprehension Toolkit is an intensive course of study designed to help intermediate-grade students understand, respond to, and learn from nonfiction text. With the teaching and learning focus on comprehension strategies, the Toolkit provides a foundation for developing independent readers and learners across the curriculum and throughout the school year." This is a packet of materials. Heinemann provides a downloadable slide presentation to explain what you can get. Also available for Grades K-2. 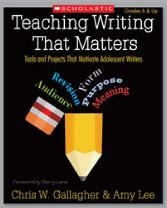 Chris Gallagher and Amy Lee, Scholastic, 2008 – Scholastic writes: The emerging Writing Studies framework encourages student growth through reflection on writing, purposeful and audience-aware projects, and the support of a writing community. The book includes innovative "project toolboxes" that show teachers how to motivate students to write with confidence and skill from their own experiences, the texts they read, and the research they conduct. Harvey Daniels, Heinemann – This veteran classroom teacher has so much to say, as you will see when you visit his many pages at Heinemann.